FAQ - Facepainting - Face The Colour- Balloon Art and Decor, Facepainting and more! 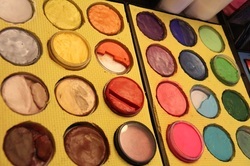 Below you will find some information and answers to frequently asked questions about Face Painting. If you still have questions after reading, please don't hesitate to contact me. What do you use to paint on skin? I ONLY use High Quality, Non-Toxic, Hypo-Allergenic, FDA Compliant Face & Body Makeup that is designed especially for the use on skin. These products have a very high pigmentation and durability and are applied to the skin with a sponge or a brush. They dry quickly and feel light on the skin. Products I use include but are not limited to Wolfe Faceart and FX Hydrocolor, Mehron Paradise AQ, Diamond FX. How long does the paint need to dry? The paint dries almost instantly. However, if additional supplies like body glitter gel is used it might take a couple of minutes for those to dry before you can touch them without the risk of smearing them. How do I remove the Face & Body paint? Face and Body paint is easily removed with soap, water and a washcloth. I have found that good old soap bars remove the paint better than liquid soaps. Depending on the length of the time you have worn your body art, skin type and method of removal, some colours may linger. Should this occur, please refrain from excessive scrubbing as this will only irritate your skin, instead wait and wash again a little while later. What about acrylic paints or markers? Why don't you use those? Acrylic paints and markers, even washable ones, can cause severe sores and skin reactions when used on the skin. They are not designed for the use on skin and should therefore NEVER be used for Body art or Face painting. What other products do you use for your work? In addition to Face and Body Makeup, brushes and sponges, we use a variety of other products to enhance and complete the designs. 1) Cosmetic-grade Glitter and Glitter Gel – the glitter that is being used is specially manufactured body glitter. It is cut very fine, has an octagon shape with rounded edges and is made out of polyester, while most craft glitters are cut in larger pieces with sharp edges that can easily irritate or damage the eyes, especially when used on the face. 3) Spirit gum (or Prosaide) – it works much like liquid latex, but is much more durable. It also takes longer to remove from the skin. This is usually done with a special remover but rubbing alcohol will also do the job. 4) No-sweat barrier spray, setting powder for the paints, mica powder, feathers, body jewels and hairspray are also among the products that are used for our work. Is there a risk of cross- contamination or transferring germs from one person to another through Face and Body paints, sponges or brushes? Most professional Face and Body paints already contain various agents to destroy microbial life. They act agains yeast, mould and bacteria. Furthermore, we operate with a ‘one sponge per person’ policy. In detail that means that a sponge or body brush, which is used to lay down the base coat on one person, will not be used on any other person thereafter. 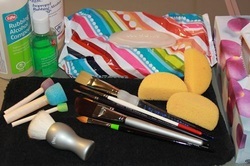 Brushes and sponges are thoroughly cleaned and sanitized after each event. The risk of cross-contamination or germ transfer through our equipment at events with numerous attendees is no higher than if you shake another persons’ hand and considerably less than that for private Prenatal and Body painting sessions. The brushes and sponges are thoroughly cleaned after each Face or Body painting event. Brushes are first rinsed with water to remove most of the remaining paint in the bristles, then cleaned with soap/ brush soap to get rid of the more persistent Face and Body Make-up residue. After that they are dipped and swirled around in 70 or 90% Isopropyl Alcohol to kill off bacteria or germs and left to dry completely before they are used again. To reduce the risk of cross-contamination and germ transfer at any event I paint at, I will not paint anyone who has open cuts or sores on the skin I am about to paint or is showing any signs of illness, including but not limited to fever, runny nose, coughs, watery eyes. There is hand sanitizer on site which I use frequently throughout the event and baby wipes are provided to remove dirt from the skin prior to painting it if needed.